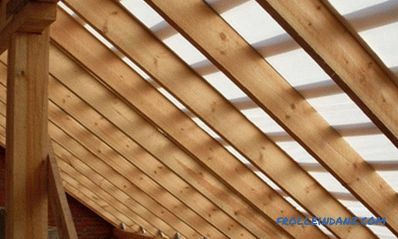 Build, with your own hands, for small members of your family, an attic bed with a working area. 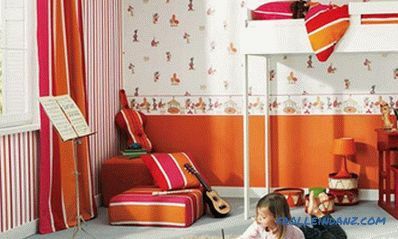 Paint the bed in your favorite colors and it will turn into a place of funny games and sweet dreams! The cost of tools and materials may vary depending on the place of purchase. 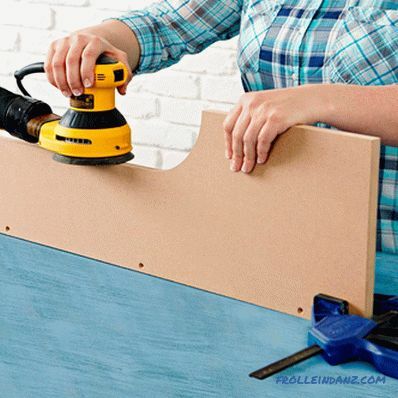 Using a circular saw and guide, cut two sheets of MDF (or chipboard) of average density needed to make the front and back of the bed (headboard A and foot B) size (Appendix, cutting scheme). Make the necessary cuts in the backs (Appendix, Figure 1). 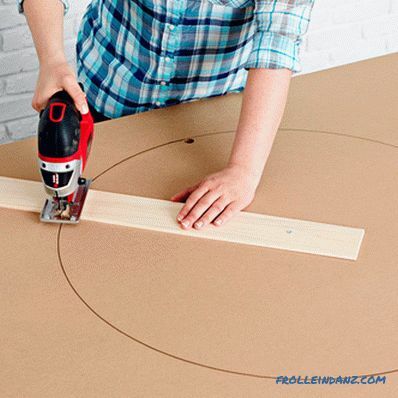 To make a round cut, drill a 10 mm starting hole from the inside of the circle drawn on the MDF sheet (touching its edge). 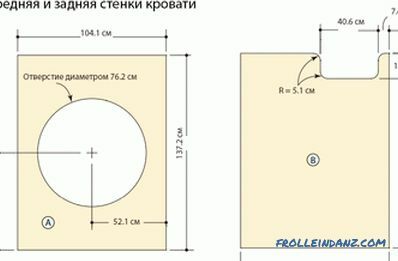 Starting from this point, cut out a round hole with a diameter of 76. 2 cm. with a jigsaw tip. 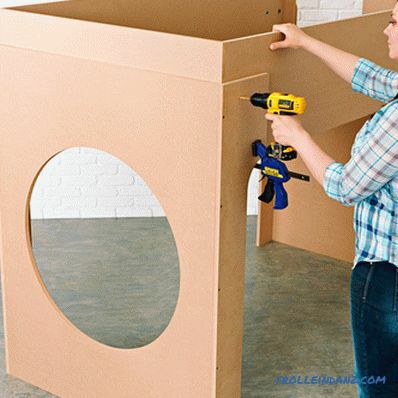 Secure one end of the rail with a length of at least 90 cm using a nail or a screw on a MDF sheet in the center of the circle. Measure from the nail 38. 1 cm (radius of the circle) and at this point of the rail fix the jigsaw. Insert the jigsaw blade into the bored starting hole. Work slowly, allowing the guide rail to set the trajectory of the jigsaw. Saw blanks for the legs (C), the upper parts of the base (D) and the headboard (E), and the side walls (F). 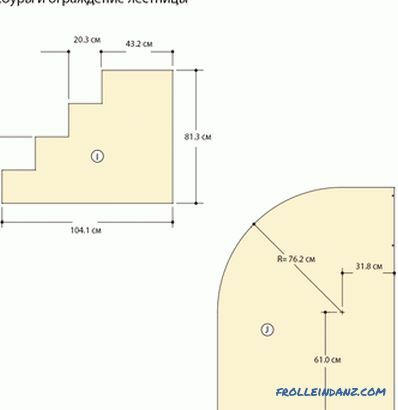 Having cut one of the legs, use it later as a template for making the rest (Appendix, Figure 2). Sand the cut pieces with grit sandpaper 120 to prepare them for assembly. Tip: There are several tricks that allow you to grind the workpiece more efficiently. 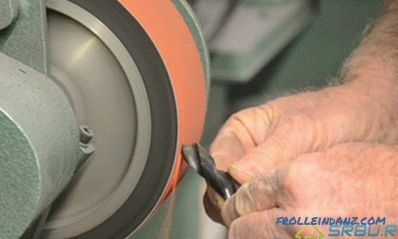 When machining curved sections, an eccentric sander will be very useful, which will help to make the curves more smooth. In the case of curves whose radius is too small for grinding, wrap the sandpaper around a round metal bar and use it for grinding. 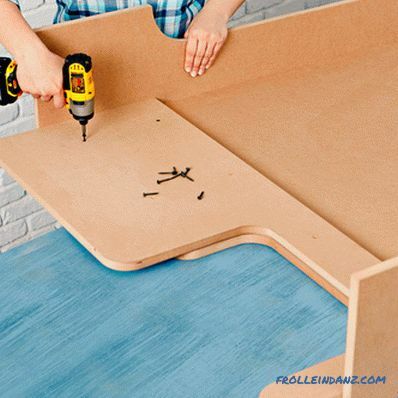 Do not forget to grind straight panel ends and flat surfaces. Drill the guide holes and re-open them. Using glue to improve the quality of the bonding of individual elements, assemble the front and back walls of the bed (Appendix, Figure 3). At assembly clamps will be useful to you. 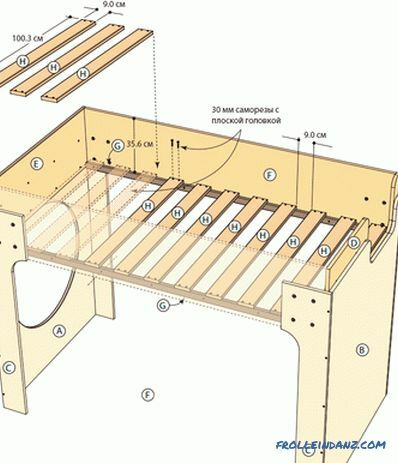 Using glue and screws, attach the upper parts of the front and rear walls of the bed (D and E) to the assemblies already assembled (Appendix, figure 4). These parts should be 12. 7 cm protrude above the upper edges of the front and rear walls. Cut two bars with a section of 5x5 cm, which will serve as supports of the rack bottom (G), as well as eleven 2. 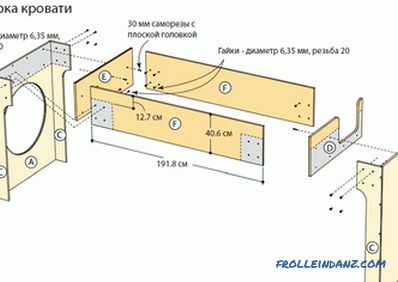 5x9 cm slats ( ) - the bottom of the rack will be made of them (Appendix, cutting list). Using glue and 50 mm self-tapping screws, fasten the supports along the lower edges of the side walls (F) (Appendix, Figure 5). Position the sides (F) between the front and rear walls of the bed and fasten them with clamps (Appendix, Figure 4). At this stage, you can not do without an assistant. Do not use glue to join them! 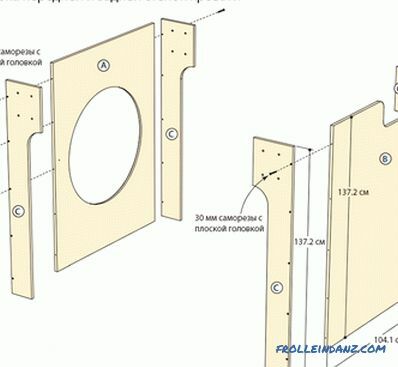 Drill 10 mm holes through the sides (F) and legs (C). 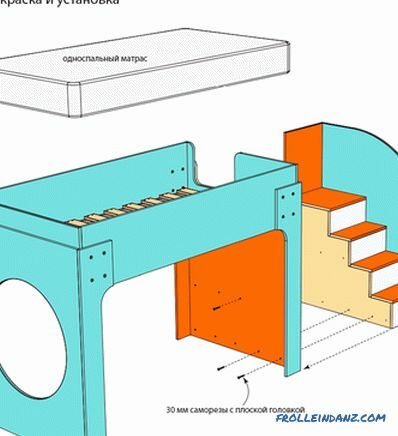 These elements will be bolted together (Appendix, Figure 4), so that a ready-made bed can be easily disassembled for transportation. Position the slats (H) on the supports (G) (Appendix, figure 5). 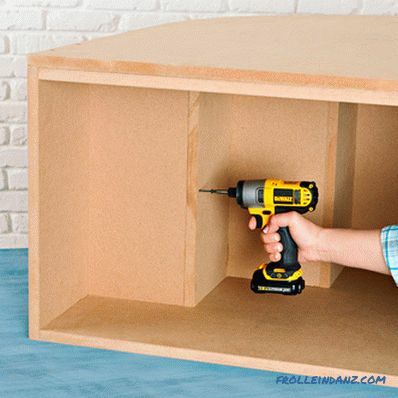 Secure them with screws, pre-drilled guide holes. The rack bottom will also be disassembled for transportation, so no glue is needed here. 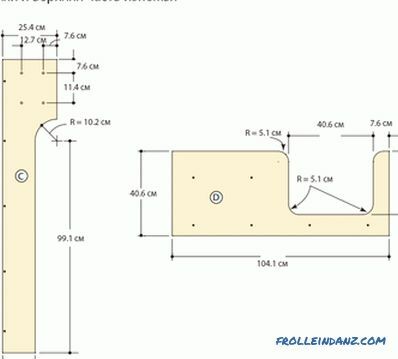 When creating the ladder, you have to do the same operations as for the construction of the bed itself: cutting parts of the right size from a large sheet of MDF or chipboard, cutting out figured elements using a jigsaw, grinding and assembly. Start by cutting out the side supports (I) and fencing (J) (Appendix, Figure 6). Tip. When the ladder is assembled, the strings (I) will be hidden. Given this, it does not make sense to make too much effort to make them perfectly smooth and neat. When making fencing (J) you can use the same guide rail that you used when cutting a round hole in the headboard (A). 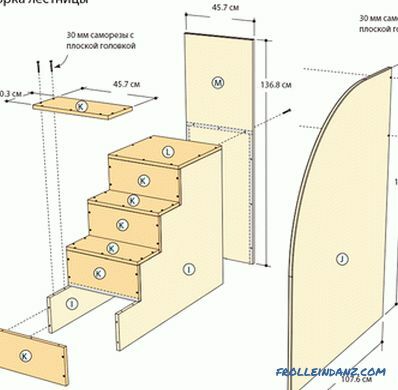 Saw out of MDF blanks for steps (K), the upper platform (L) and the back wall of the stairs (M) (Appendix, list and cutting scheme). Sand all sawed fragments before assembly. Using glue and self-tapping screws, attach the risers and steps (K) to the kosoura (I) (Appendix, Figure 7). Using glue and screws, fasten the upper platform (L) on the stairs (Appendix, Figure 7). 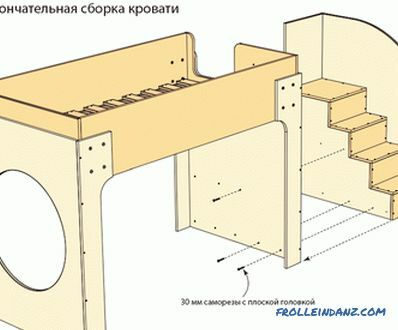 To strengthen the staircase, lay it on its side and secure the risers with steps from the inside (Appendix, Figure 7). Attach the back wall of the staircase (M) and the fence (J) (Appendix, Figure 7). For fixing the back wall, use glue and screws. 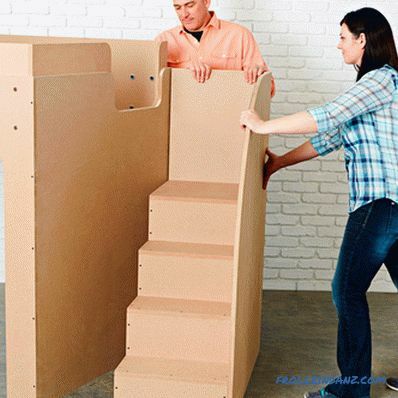 Secure the fence without using glue so that it can be easily removed at the stage of painting the stairs (when the details of the stairs are painted, install the fence into place using both glue and screws). Slide the assembled ladder in its place (Appendix, Figure 8). The connection is carried out without the use of glue: during transportation, the ladder will move as a separate component. Screws are screwed through the wall of the bed in the left oblique ladder. Disconnect the ladder, slatted bottom (H), and side walls (F) to disassemble the bed. Smooth all sharp edges of the parts with 100 grit sandpaper. 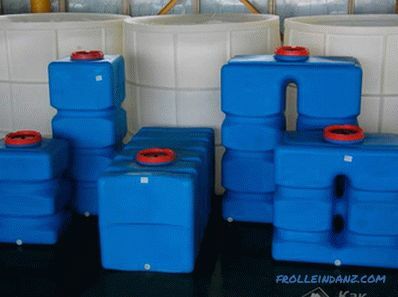 Prime and paint the surfaces, choosing the color at your discretion. Sand the surfaces after priming and after applying the first coat of paint using sanding sponges of medium and fine grain. 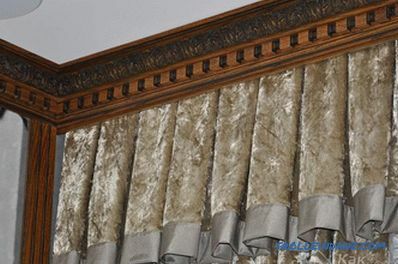 This operation will get rid of asperities and color heterogeneity (especially at the edges) and will ensure a smooth surface after applying additional layers of paint. Move the bed to its permanent place and proceed to the final assembly. Fasten the sides (F) with the front and rear walls, for which you will have to re-engage your partner. Fasten the rack bottom removed earlier (H) and the ladder (Appendix, Figure 9). 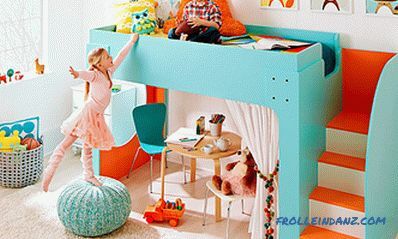 That's all ... Be proud: you made a children's loft bed with your own hands. To complete the picture, it remains to add a mattress, a set of bed linen and ... of course, children.